Catching up on my latest techie/geek news, I saw this news-bit about the new Nokia N-Gage platform update, the N-81 gaming platform. It’s a fine looking update from their awful first- and second-gen gaming phones. 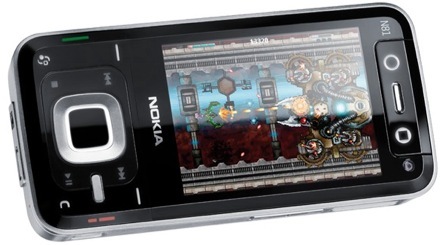 This is Nokia’s new N-81 gaming device built upon their revamped N-Gage gaming platform. The S60 device packs HSDPA (sorry, no US band support) for on-line gaming, integrated speakers (and 3.5-mm headphone jack), and D-pad navigation for getting your game on. Still, it’s not just for gaming as it fully supports all the audio and video you’d expect in a new “pane-driven,” UI which carousels your windows instead of lining them up in tabs — a UI which will evolve in the coming months in line with Ovi. On sale Q4 in Europe in an 8GB flash model (Ã¢â€šÂ¬431/$585) or Ã¢â€šÂ¬360/$490 pre-bunged with a 2GB microSD card. The screen and control layout looks so much better than the previous versions. There’s a gallery with more images in the Engadget article linked above. This might even be enough of an improvement to get folks to finally buy in to the N-Gage platform.